Waterfront living is not a unique concept in Dubai. Now, combine that with living next to the world’s largest observation wheel and a novelty factor sets in. We are referring to residences on the Bluewaters Island, off the coast of Jumeirah Beach Residence (JBR) and adjacent to the London Eye-like Ain Dubai, touted to be the world’s largest ferris wheel at over 210 metres. Construction is in full swing for various phases on the man-made island: residential, leisure and retail, Ain Dubai and two hotels. The waterfront residences include 10 mid-rise towers with 698 one, two, three, and four-bed apartments, and four five-bedroom penthouses. Bluewaters will also include 17 one to four-bedroom townhouses. Handover of residences at Bluewaters will commence during the first quarter of 2018, according to a Meraas spokesperson. “The residences at Bluewaters were released to the market earlier this year, and both apartments and townhouses have attracted strong interest from local and international markets. 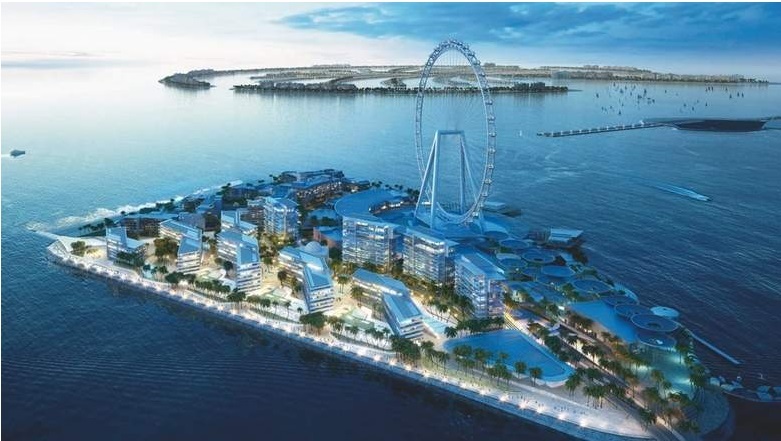 The location has proven to be a big factor in sales to date, as well as the fact that homeowners will be able to live next to the world’s largest and tallest observation wheel, Ain Dubai,” the spokesperson told Khaleej Times. “On the first weekend after the official launch of Bluewaters Island on March 6, Meraas released only one building [no 6] but later quickly released a second building [no 3] presumably to offer different options to buyers. Now, a third building [no 8] has also been released. In terms of sales, the first few weekends went well and given the sales centre is opposite the project, there is always good interest from buyers but since then, sales have slowed down,” said Mario Volpi, chief sales officer, Kensington Exclusive Properties. Meraas launched Bluewaters residences at Dh2,100 to Dh2,600 per square foot. These rates are attractive, considering Bluewaters Island is an ultra high-end man-made project with a record-breaking landmark. “If you look at other man-made islands such as the Palm Jumeirah, Al Marsa Islands, Jumeirah Bay, etc., the pricing is in line with these developments. An indirect comparison can also be made to prices in Downtown Dubai, Dubai Marina, Dubai Creek, etc,” Mansi Saxena, marketing director at SPF Realty, told Khaleej Times. Meanwhile, the Meraas spokesperson said demand for residences has been from home owners, especially families, rather than purely investment. “Given that there are less than 700 apartments in total to be built on the island means that it is not an inexhaustible supply of units, so they could become relatively rare on the secondary market if owners decide not to sell on,” observed Volpi. The whole development is hospitality-based with a wide offering of over 200 food and beverage outlets, hotels, retail and leisure elements and a plaza. The island will be connected to Sheikh Zayed Road by a dedicated bridge, work on which is already complete. The installation of a driverless transport system comprising 25 autonomous vehicles is expected to start soon. The 5-star hotels on the island include two of four new hotel brands launched by Meraas in April 2017 – Re Vera Bluewaters Resort and Vivus Bluewaters Resort. “It is a great investment proposition as Ain Dubai is going to be the next big landmark on the Dubai skyline. Meraas’ master community, with the right mix of retail and international hotels on an island 300 metres off JBR and only 719 residences, is the making of a sought-after residential community, which by default makes it a very attractive investment proposition,” SPF’s Saxena added.